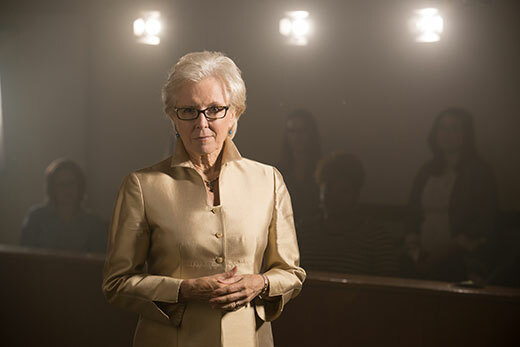 Adjunct professor Janet Metzger teaches courses where drama and the law combine, helping aspiring attorneys become confident, persuasive storytellers. Photo by Bartram Nason. The crime scene was lit just enough to make their facial features clear to one another, but the streetlight cast an intense glow, making it difficult to tell what color his shirt was. The streets surrounding them were dark and damp. There was an odor in the air — one that was hard to forget. It lingered in their clothes through the next day when they staggered into the police station lobby. You see it. You’re there. And when a lawyer effectively sets the scene, she paints a picture the way she wants the jurors to see it, too. She brings them with her as she steps into the past and influences perception. Janet Metzger, adjunct professor teaching Courtroom Persuasion/Drama I, helps third-year law students learn the art of storytelling. She doesn’t turn lawyers into actors; she helps them become more confident and persuasive in front of a group, whether that group is a board of directors, a team of other attorneys or a jury desperately wanting to learn the truth. “Lawyers and actors have in common an interest in what motivates people to do the things they do,” Metzger explains. Her premise is based on knowledge she’s gleaned from attorneys during the 16 years she’s taught this course at Emory Law: It’s critical that the listener believes that the speaker is authentic. Shaky knees and a wobbly, unsure voice threaten that goal. Metzger says she helps her students to “relax into themselves.” She accomplishes this through performing arts techniques such as theater games designed to develop concentration and focus and improvisation activities that help students become better at thinking on their feet. They study their own demeanor, physical tics and habits, posture and movement. She helps a fidgeting student figure out why he’s nervous — and what it will take for him to eliminate that feeling. She teaches them to focus on what it is they want to convey to people. With a degree in music education and a background in the creative arts, how did Metzger end up surrounded by attorneys — a traditionally sober and pragmatic group? In 1985, Kessler-Eidson Trial Techniques faculty brought in a band of performers to help the 2L students after their videotaped arguments. Once the recordings had been made, the students would take their VHS tapes to a playback room, where they would watch with a faculty lawyer and one of the performers and receive feedback on their delivery. Metzger was one of those performers. Over the years, the lawyers who came in mentored her. She had some skills to share — not necessarily from a legal perspective, but from a communications perspective. She was approached to teach this class and decided that it could be valuable. Some schools don’t see the need for a courtroom drama class, but it’s a beloved tradition at Emory Law — a tradition that helps third-year students counter the nerves of new lawyer-hood. And they build these skills sitting at the feet of a serious creative — an oxymoron in many environments. Metzger is a vocalist, a voiceover artist who’s voiced numerous audiobooks, and an actor. (See her in "42," the Jackie Robinson story.) She’s lately considered becoming an author as well, to share her methods with other law schools and students. But there are challenges: “Every time I try to sit down and write something, it’s overwhelming. There’s so much to say and so many stories to tell,” she says. “I can’t imagine how people would learn to do this just by reading it. It’s like learning to play an instrument. "I could write a book on learning to play the piano, but if someone doesn’t sit down with a teacher, get feedback and get suggestions on how to do it, they can’t develop their own personal instrument – themselves."